Non-Invasive Body Contouring that helps you achieve a natural-looking, slimmer appearance. SculpSure® is a non-invasive treatment that can eliminate unwanted fat from the abdomen and love handles, thighs, back rolls, and arms. For people who do not desire or cannot undergo surgery, non-invasive lipolysis with SculpSure® is an effective way to tone these areas of the body. With SculpSure®, patients can have a slimmer waistline, smoother hips, and a flatter abdomen. Stubborn fat can get in the way of a slender, youthful body and give you unsightly bulges, rolls, or pooches. 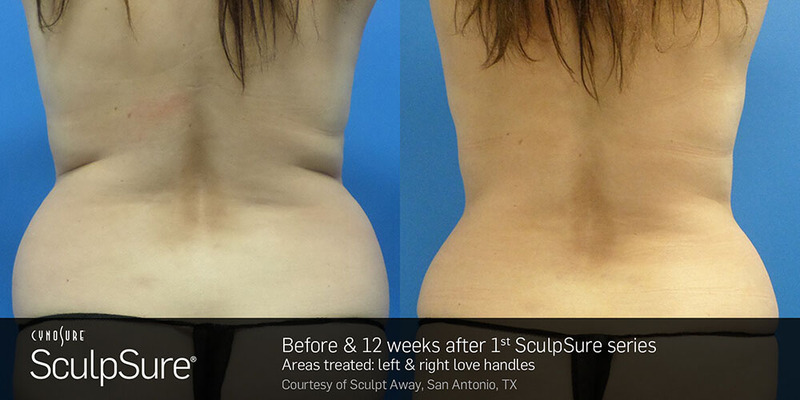 SculpSure® eliminates fat from the abdomen and hips so that your waist is taut and firm like that of a young adult. How we feel about our bodies plays a role in how confident we are. If you are unhappy with your appearance, you may suffer from low self-confidence as a result. SculpSure® can improve your body shape so that you can feel proud of the body you have and feel more confident about yourself. Your waistline is one of the first places to pack on stubborn fat. Excess fat around the abdomen and hips can be difficult if not impossible to get rid of with a healthy diet and exercise. SculpSure® can trim your waistline and hips to give you the slimmer figure you want. Excess fat around the waist can be accompanied by loose skin. Because SculpSure® uses laser energy, a small degree of skin tightening can result from the treatment, which may enhance your results and give you a firmer waistline. Surgical fat removal methods such as liposuction have long recovery periods, may leave scars, and can cause undesirable surgical complications. SculpSure® offers non-invasive lipolysis with effective results and none of the disadvantages of surgery. A SculpSure® treatment is performed in-office and lasts about 25 minutes. The SculpSure® applicator is held to your abdomen, love handles, back rolls, or arms so that the laser energy can permeate your skin. With SculpSure® technology, the laser passes through your skin to attack the fat cells and melt them down. After the treatment has ended, you may go home and resume your normal activities. Over the next six to eight weeks, your body will flush out the destroyed fat cells to reveal a smoother and thinner waistline. 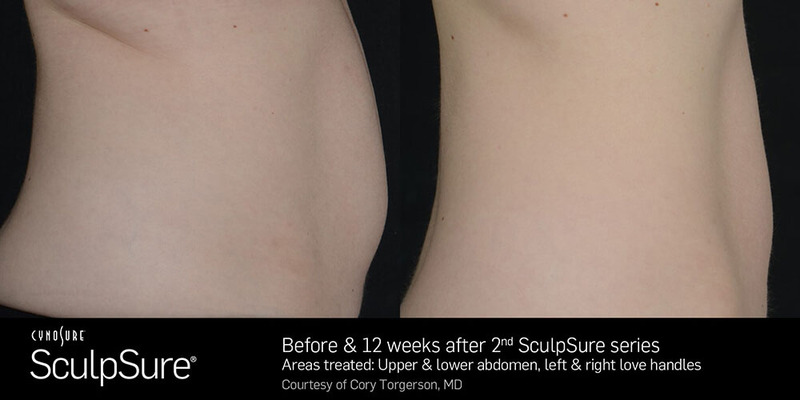 You’ve Just Had SculpSure®! Now What? You can resume normal daily activities. Some patients may experience minor tenderness, tingling, or numbness in the treated area(s) for up to a few hours after treatment. Your body will be flushing out the destroyed fat cells. At this point, you will not be able to see any significant results. Your body will continue to flush out the destroyed fat cells. You may begin to see noticeable results and improvements in your body shape. Most of your results will be visible by now. As much as 24 percent of the fat in the treated area(s) will be eliminated from your body.